Price controls are governmental restrictions on the prices that can be charged for goods and services in a market. The intent behind implementing such controls can stem from the desire to maintain affordability of goods even during shortages, and to slow inflation, or, alternatively, to ensure a minimum income for providers of certain goods or a minimum wage. There are two primary forms of price control, a price ceiling, the maximum price that can be charged, and a price floor, the minimum price that can be charged. Historically, price controls have often been imposed as part of a larger incomes policy package also employing wage controls and other regulatory elements. Although price controls are sometimes used by governments, economists usually agree that price controls don't accomplish what they are intended to do and are generally to be avoided. For example, nearly three-quarters of economists surveyed disagreed with the statement, "Wage-price controls are a useful policy option in the control of inflation." The Roman Emperor Diocletian tried to set maximum prices for all commodities in the late 3rd century AD but with little success. In early 14th century, the Delhi Sultanate ruler Alauddin Khalji instituted several market reforms, which included price-fixing for a wide range of goods, including grains, cloth, slaves and animals. However, a few months after his death, these measures were revoked by his son Qutbuddin Mubarak Shah. During the French Revolution, the Law of the Maximum set price limits on the sale of food and other staples. Governments in planned economies typically control prices on most or all goods but have not sustained high economic performance and have been almost entirely replaced by mixed economies. Price controls have also been used in modern times in less-planned economies, such as rent control. During World War I, the United States Food Administration enforced price controls on food. Price controls were also imposed in the US and Nazi Germany during World War II. Wage controls have been tried in many countries to reduce inflation, seldom successfully. Modern neoclassical economic theory supports the alternative remedy of reducing the money supply and proposes that monetary inflation is caused by too much money creation by the central bank. The National Board for Prices and Incomes was created by the government of Harold Wilson in 1965 in an attempt to solve the problem of inflation in the British economy by managing wages and prices. The Prices and Incomes Act 1966 c. 33 affected UK labour law, regarding wage levels and price policies. It allowed the government to begin a process to scrutinise rising levels of wages (then around 8% per year) by initiating reports and inquiries and ultimately giving orders for a standstill. The objective was to control inflation. It proved unpopular after the 1960s. In the United States, price controls have been enacted several times: During World War I and World War II, and by President Nixon. The first time price controls were enacted nationally was in 1906 as a part of the Hepburn Act. In addition, States have sometimes chosen to implement their own control policies. In the 1860s, several midwestern states of the United States, namely Minnesota, Iowa, Wisconsin, and Illinois, enacted a series of laws called the Granger Laws, primarily to regulate rising fare prices of railroad and grain elevator companies. California controls the prices of electricity within the state, which conservative economist Thomas Sowell blames for the occasional electricity shortages the state experiences. Sowell said in 2001, "Since the utility companies have been paying more for electricity than they were allowed to charge their customers, they were operating in the red and the financial markets are downgrading their bonds." California's price-setting board agreed to raise rates but not as much as the companies were paying on the wholesale market for their electricity. Economist Lawrence Makovich contended, "We've already seen in California that price caps on retail rates increased demand and made the shortage worse and price caps also forced the largest utility, Pacific Gas and Electric Company, into bankruptcy in four months." While some charged that electricity providers had in past years charged above-market rates, in 2002 the San Francisco Chronicle reported that before the blackouts, many energy providers left the state because they could make a greater profit in other Western states. The Federal Energy Regulatory Commission stepped in and set price caps for each megawatt of power bought after lifting the caps to avoid rolling blackouts six months previously. The state of Hawaii briefly introduced a cap on the wholesale price of gasoline (the Gas Cap Law) in an effort to fight "price gouging" in that state in 2005. Because it was widely seen as too soft and ineffective, it was repealed shortly thereafter. Protesters call for an increased legal minimum wage as part of the "Fight for $15" effort to require a $15 per hour minimum wage in 2015. A government-set minimum wage is a price floor on the price of labour. A price floor is a government- or group-imposed price control or limit on how low a price can be charged for a product, good, commodity, or service. A price floor must be higher than the equilibrium price in order to be effective. The equilibrium price, commonly called the "market price", is the price where economic forces such as supply and demand are balanced and in the absence of external influences the (equilibrium) values of economic variables will not change, often described as the point at which quantity demanded and quantity supplied are equal (in a perfectly competitive market). Governments use price floors to keep certain prices from going too low. Two common price floors are minimum wage laws and supply management in Canadian agriculture. Other price floors include regulated US airfares prior to 1978 and minimum price per-drink laws for alcohol. A related government intervention, which is also a price control, is the price ceiling; it sets the maximum price that can legally be charged for a good or service, with a common example being rent control. A price ceiling is a government-imposed price control, or limit, on how high a price is charged for a product, commodity, or service. Governments use price ceilings to protect consumers from conditions that could make commodities prohibitively expensive. Such conditions can occur during periods of high inflation, in the event of an investment bubble, or in the event of monopoly ownership of a product, all of which can cause problems if imposed for a long period without controlled rationing, leading to shortages. Further problems can occur if a government sets unrealistic price ceilings, causing business failures, stock crashes, or even economic crises. In unregulated market economies, price ceilings do not exist. The primary criticism leveled against the price ceiling type of price controls is that by keeping prices artificially low, demand is increased to the point where supply can not keep up, leading to shortages in the price-controlled product. For example, Lactantius wrote that Diocletian "by various taxes he had made all things exceedingly expensive, attempted by a law to limit their prices. Then much blood [of merchants] was shed for trifles, men were afraid to offer anything for sale, and the scarcity became more excessive and grievous than ever. Until, in the end, the [price limit] law, after having proved destructive to many people, was from mere necessity abolished." As with Diocletian's Edict on Maximum Prices, shortages lead to black markets where prices for the same good exceed those of an uncontrolled market. Furthermore, once controls are removed, prices will immediately increase, which can temporarily shock the economic system. Black markets flourish in most countries during wartime. States that are engaged in total war or other large-scale, extended wars often impose restrictions on home use of critical resources that are needed for the war effort, such as food, gasoline, rubber, metal, etc., typically through rationing. In most cases, a black market develops to supply rationed goods at exorbitant prices. The rationing and price controls enforced in many countries during World War II encouraged widespread black market activity. One source of black-market meat under wartime rationing was by farmers declaring fewer domestic animal births to the Ministry of Food than actually happened. Another in Britain was supplies from the US, intended only for use in US army bases on British land, but leaked into the local native British black market. A classic example of how price controls cause shortages was during the Arab oil embargo between October 19, 1973 and March 17, 1974. Long lines of cars and trucks quickly appeared at retail gas stations in the U.S. and some stations closed because of a shortage of fuel at the low price set by the U.S. Cost of Living Council. The fixed price was below what the market would otherwise bear and, as a result, the inventory disappeared. It made no difference whether prices were voluntarily or involuntarily posted below the market clearing price. Scarcity resulted in either case. Price controls fail to achieve their proximate aim, which is to reduce prices paid by retail consumers, but such controls do manage to reduce supply. Nobel prize winner Milton Friedman said "We economists don't know much, but we do know how to create a shortage. If you want to create a shortage of tomatoes, for example, just pass a law that retailers can't sell tomatoes for more than two cents per pound. Instantly you'll have a tomato shortage. It's the same with oil or gas." U.S. President Richard Nixon's Secretary of the Treasury, George Shultz, enacting Nixon's "New Economic Policy," lifted price controls that had begun in 1971 (part of the Nixon Shock). This lifting of price controls resulted in a rapid increase in prices. Price freezes were re-established five months later. Stagflation was eventually ended in the United States when the Federal Reserve under chairman Paul Volcker raised interest rates to unusually high levels. This successfully ended high inflation but caused a recession that ended in the early 1980s. ^ Alston, Richard M.; Kearl, J.R.; Vaughan, Michael B. (May 1992). "Is There a Consensus Among Economists in the 1990's?" (PDF). 82 (2). American Economic Review: 203–209. Retrieved October 17, 2015. ^ Banarsi Prasad Saksena (1992) . "The Khaljis: Alauddin Khalji". In Mohammad Habib and Khaliq Ahmad Nizami (ed.). A Comprehensive History of India: The Delhi Sultanat (A.D. 1206–1526). 5 (Second ed.). The Indian History Congress / People's Publishing House. p. 429. OCLC 31870180. ^ "File: "Prices charged in this store will not exceed those indicated in the most recent list of Fair Prices applicable to this – NARA – 512556.jpg – Wikimedia Commons". Retrieved 2012-01-21. ^ "File: "Closed. Public Notice. For Violation of the rules of the United States Food Administration This Place is Closed days... – NARA – 512564.tif – Wikimedia Commons". Retrieved 2012-01-21. ^ "File: "This Store sells at FAIR PRICES as interpreted by U.S. Food Administration...", ca. 1917 – ca. 1919 – NARA – 512714.tif – Wikimedia Commons". Retrieved 2012-01-21. ^ "File: "We violated the regulations of the Food Administration but have pledged Full Obedience in the Future. ", ca. 1917 – ca. – NARA – 512528.jpg – Wikimedia Commons". Retrieved 2012-01-21. ^ "File: "Cost of Living 1918–1944" – NARA – 514088.jpg – Wikimedia Commons". Retrieved 2012-01-21. ^ a b Sowell, Thomas (2001-01-11). "The Cause of the California Electricity Shortages: "Price Controls"". Capitalism Magazine. Retrieved 2008-11-03. ^ "Power problems". NewsHour with Jim Lehrer. PBS. 2001-01-04. Retrieved 2008-11-06. ^ a b "Power struggle". NewsHour with Jim Lehrer. PBS. 2001-06-20. Retrieved 2008-11-06. ^ a b Martin, Mark (2002-05-10). "Memos show makings of power crisis". San Francisco Chronicle. Retrieved 2008-11-06. ^ "Price floor – Definitions from Dictionary.com". dictionary.reference.com. Retrieved 2008-05-02. ^ Gregory,, Mankiw, N. Principles of macroeconomics (Eighth ed.). Australia. ISBN 1305971507. OCLC 953710348. ^ a b c Walter J. Wessels, Economics (2000), pp. 232–33. ^ Lactantius. "CHAP. VII.". On the Deaths of the Persecutors. ca. 300 (Christian Classics Ethereal Library ed.). Calvin College. ^ The Home Front (facsimile ed.). London: Imperial War Museum. July 1945. ISBN 978-1-904897-11-8. ^ "Controls blamed for U.S. energy woes", Los Angeles Times, February 13, 1977, Milton Friedman press conference in Los Angeles. ^ "George P. Shultz (1972–1974)". Treasury.gov. 2010-11-20. Retrieved 2013-09-27. The economy of Venezuela is largely based on the petroleum sector and manufacturing. In 2014, total trade amounted to 48.1% of the country's GDP. Exports accounted for 16.7% of GDP and petroleum products accounted for about 95% of those exports. Venezuela is the sixth largest member of OPEC by oil production. Since the 1920s, Venezuela has been a rentier state, offering oil as its main export. 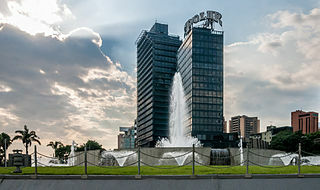 From the 1950s to the early 1980s, the Venezuelan economy experienced a steady growth that attracted many immigrants, with the nation enjoying the highest standard of living in Latin America. During the collapse of oil prices in the 1980s, the economy contracted the monetary sign, commenced a progressive devaluation and inflation skyrocketed to reach peaks of 84% in 1989 and 99% in 1996, three years prior to Hugo Chávez taking office. The nation, however, has experienced hyperinflation since 2015 far exceeding the oil price collapse of the 1990s. In economics, inflation is a sustained increase in the general price level of goods and services in an economy over a period of time. When the general price level rises, each unit of currency buys fewer goods and services; consequently, inflation reflects a reduction in the purchasing power per unit of money – a loss of real value in the medium of exchange and unit of account within the economy. The measure of inflation is the inflation rate, the annualized percentage change in a general price index, usually the consumer price index, over time. The opposite of inflation is deflation. 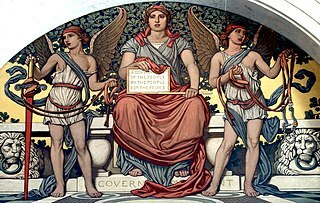 In economics and political science, fiscal policy is the use of government revenue collection and expenditure (spending) to influence the economy. According to Keynesian economics, when the government changes the levels of taxation and government spending, it influences aggregate demand and the level of economic activity. Fiscal policy is often used to stabilize the economy over the course of the business cycle. Rationing is the controlled distribution of scarce resources, goods, services, or an artificial restriction of demand. Rationing controls the size of the ration, which is one's allowed portion of the resources being distributed on a particular day or at a particular time. There are many forms of rationing, and in western civilization people experience some of them in daily life without realizing it. The industry of the Soviet Union was usually divided into two major categories. Group A was "heavy industry," which included all goods that serve as an input required for the production of some other, final good. Group B was "consumer goods", including food, clothing and shoes, housing, and such heavy-industry products as appliances and fuels that are used by individual consumers. From the early days of the Stalin era, Group A received top priority in economic planning and allocation so as to industrialize the Soviet Union from its previous agricultural economy. A price floor is a government- or group-imposed price control or limit on how low a price can be charged for a product, good, commodity, or service. A price floor must be higher than the equilibrium price in order to be effective. The equilibrium price, commonly called the "market price", is the price where economic forces such as supply and demand are balanced and in the absence of external influences the (equilibrium) values of economic variables will not change, often described as the point at which quantity demanded and quantity supplied are equal. Governments use price floors to keep certain prices from going too low. In economics, a shortage or excess demand is a situation in which the demand for a product or service exceeds its supply in a market. It is the opposite of an excess supply (surplus). 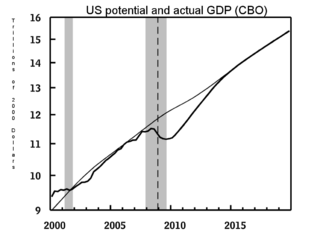 An inflationary gap, in economics, is the amount by which the actual gross domestic product exceeds potential full-employment GDP. It is one type of output gap, the other being a recessionary gap. The 1980s austerity policy in Romania was imposed by Romanian dictator Nicolae Ceaușescu in order to pay out the external debt incurred by the state in the 1970s. Beginning in 1981, the austerity led to economic stagnation throughout the 1980s, being a "sui generis shock therapy" which lowered the competitiveness of the Romanian economy and decreased the amount of exports. When elected in 2013, Nicolás Maduro continued the majority of existing economic policies of his predecessor Hugo Chávez. When entering the presidency, President Maduro's Venezuela faced a high inflation rate and large shortages of goods that was left over from the previous policies of President Chávez. These economic difficulties that Venezuela was facing were one of the main reasons of the 2014–15 Venezuelan protests. President Maduro has blamed capitalism for speculation that is driving high rates of inflation and creating widespread shortages of staples, and often said he was fighting an "economic war", calling newly enacted economic measures "economic offensives" against political opponents he and loyalists state are behind an international economic conspiracy. However, President Maduro has been criticized for only concentrating on public opinion instead of tending to the practical issues economists have warned the Venezuelan government about or creating any ideas to improve the economic situation in Venezuela such as the "economic war".